Name-calling is abhorrent, destructive and a form of bullying and poor Eric is subjected to it continually, both at home and at school. In class his teacher calls him a dunce and allows his classmates to use similarly demeaning and abusive names. Eric feels so alone in the world that one day he decides to run away. While so doing he hears a woodcutter’s cries of ‘MONSTER!’ whereupon all the people flee for their lives, uttering a sequence of cries in Eric’s hearing that only ‘a twit, a nitwit, a dummy, a dunce and a dope’ would be stupid enough face such a creature. Thus it is that Eric stands alone to confront the terrible monster and face him Eric does. But his profession to the monster of how he feels about himself provokes an unexpected response: the supposedly fearsome beast tells him that he too has been made to feel useless and unloved. 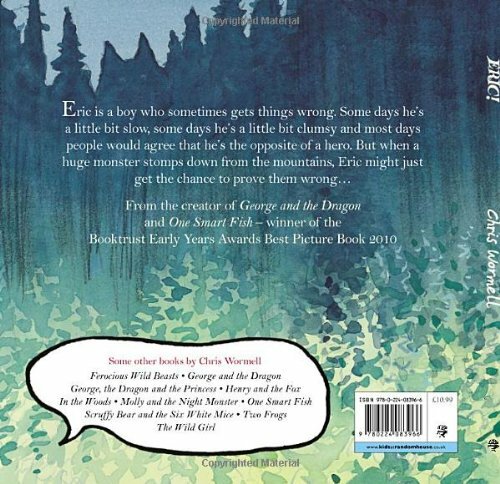 Eric’s offer of friendship, together with his description of the monster’s effect on the people of the neighbourhood, result in a huge boost of self-esteem for both monster and Eric – the hero of the hour. In his opening paragraph, Wormell engages the reader by admitting that he, (like most of us), has been made at times to feel inadequate, thus setting the scene for Eric’s story. 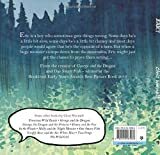 The author’s judicious use of speech and thought bubbles adds to the pace and drama of the story, which is set in a folktale world of kings and castles created in water colour, ink and crayon.